The Vision 2050 report takes a refreshingly pro-active look at what global environmental challenges mean for business. For 18 months, 29 major global corporations were brought together in a project under the World Business Council for Sustainable Development to discuss what the world could look like in 2050. Concerned with the environmental challenges confronting societies, this report calls for fundamental transformations in both production and consumption. Some businesses will be able to lead this transformation, turning challenges into opportunities for sustainability. This report considers how businesses can be a part of the solution, and it lays out a new agenda with concrete must-do requirements for achieving measurable outcome. The transformation ahead represents vast opportunities in a broad range of business segments as the global challenges of growth, urbanization, scarcity and environmental change become the key strategic drivers for business in the coming decade. 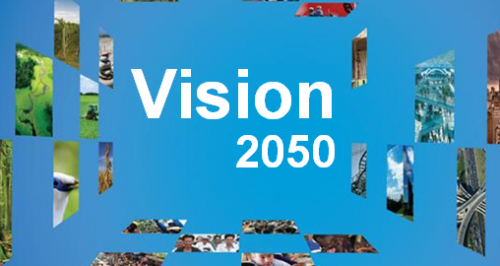 Download the Vision 2050 report, World Business Council for Sustainability.